All our restaurants serve you the same variety of barbeque and rib sandwiches, BBQ plates and dishes. Please review the big menu board at the counters! 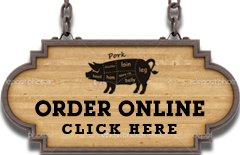 All menu items are available for pickup, catering and bulk order. A 4oz chopped pork sandwich. Served on a bun with a choice of sauce, with or without coleslaw on the sandwich. A 6oz chopped pork sandwich. Served on a bun with a choice of sauce, with or without coleslaw on the sandwich. A 4 oz serving of hash served on a bun with a choice of sauce, with or without coleslaw on the sandwich. A 6oz serving of hash served on a bun with a choice of sauce, with or without coleslaw on the sandwich. A 8oz boneless skinless chicken breast, marinated in a mild tomato based sauce. Served on a bun with a choice of sauce, with or without coleslaw on the sandwich. 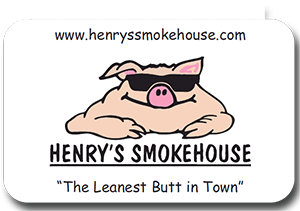 © 2015 Henry's Smokehouse. All rights reserved.